1) Yesterday, the House of Representatives voted 289-139 in favor of extending and expanding SCHIP. As we reported Tuesday, among the bill’s numerous tobacco tax increases is a 750% hike in the federal tax on large cigars. The cap on the 52.4% tax (on the wholesale price) is being increased from 5 to 40 cents. Yesterday, the bill passed its first Senate test by surviving committee. 2) Following our Tuesday coverage of SCHIP, the anti-smoking zealots over at Action on Smoking and Health (ASH) decided to hotlink to a Stogie Guys image. Rookie mistake. As a result, we made the graphic to the right appear on ASH’s homepage for over 12 hours (here’s a humorous screenshot). 3) Baltimore officials announced on Wednesday a prohibition on “the sale of individual, cheap cigars” like Swisher Sweets and Phillies. Part of a growing trend, the move is intended to discourage youth tobacco usage by keeping prices high. No word on how the city health commissioner plans to prevent kids from pooling money together and splitting up packs of five. 5) Inside the Industry: The Colibri Group, known for its upscale lighters, unexpectedly shut its doors and filed for bankruptcy. Alec Bradley revamped its website. Cigar Aficionado shocked many cigar smokers by picking the Casa Magna Colorado Robusto as its cigar of the year. 6) Around the Blogs: Cigar Jack smoked a Perdomo Squared Maduro. Keepers of the Flame lit up a Taboo Twist. Cigar Inspector tried the La Aurora 1495 Cameroon. A Cigar Smoker reviewed a Padilla 1968. Stogie Review fired up a Casa Magna Colorado Belicoso. 7) Deal of the Week: Not surprisingly, there’s a new inauguration-themed cigar sampler: the Presidential Sampler. For $49.99, you get ten premium smokes including one each from Cohiba, Graycliff, CAO, Romeo y Julieta, Camacho, Padilla, and Montecristo. Get yours here. You know guys, I'm with you on the extra taxes. I don't like them either. But, likening one's opposition to Nazis is just not an effective tactic. No need to take the low road! I understand your concern, Robert, but I think it’s a mistake to read this as likening the anti-tobacco movement to the many atrocities of fascism. Rather, the Stogie Guys are being quite literal. It’s a well-understood fact that the Nazis, in their attempt to exert control over the everyday choices of ordinary citizens, sought to ban smoking. ASH apparently wants the same control today over Americans, and it’s helpful to point out the ludicrousness of their aims. I wouldn’t read too much into their joke. It is a fact that one of the planks of the NDSAP (the Nazi Party) was an agressive anti-smoking policy. It would be foolish, not to mention tasteless, to compare today's treatment of smokers to Hitler's treatment of the Jews. 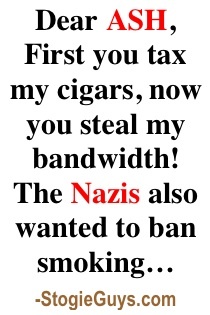 But comparing today's nicotine nannies to the original nicotine Nazis is a perfect, one to one comparison. And the similarity is frightening. Nice job messing with the the ASHoles. Definite two thumbs up on getting the clowns from Ash. I have to say, the whole premise of the S-CHIP legislation is inherently flawed, in that they somehow believe that basic economics (supply, demand, pricing) doesn't apply to tobacco products. First let me say I enjoy your site. There's lots of cigar sites out there, but few that I read regularly. One note about the review round up — it looks like A Cigar Smoker actually reviewed the Serie '68, not the 1932. Not a huge deal, but thought I'd let you know.